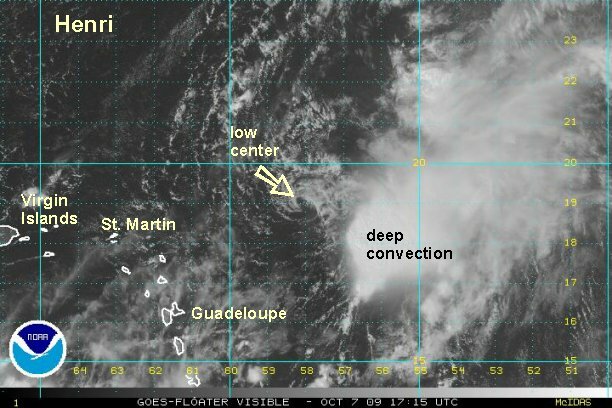 Visible satellite imagery clearly show a low level circulation east of the Leewards this afternoon. Upper air winds have relaxed enough that deep convection has not only remained east of the low center but now has built over it. If a tiny system was recently classified like Grace....up to 70 mph - surely this qualifies as a tropical depression. At 4 pm edt / ast the "tropical disturbance" was centered near 17.8° N / 53.5° W or about 525 miles east of the Leewards. Top sustained winds are estimated at 35 mph with stronger gusts in the storms to the east of the center. This disturbance was moving northwest at about 17 mph. 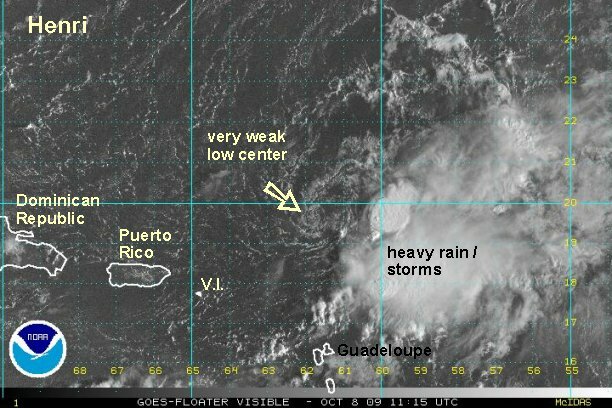 ***update NHC changed their outlook from "low" to "high" and will start advisories on Henri at 5 pm. Just added NHC's forecasts. There initial intensity is 40 mph. Overnight showers and storms associated with Henri have increased in areal coverage and intensity. Our main question is if this has actually translated to increased surface wind speed. The last quickscat doesn't even show a closed low at the surface. This would mean that their are still solid winds in the thunderstorm complex to the east - but development would be slow. We are taking the middle road of the hurricane centers thinking and what the Quickscat is showing....which really isn't too much different. Once the visible satellite imagery comes in we'll be able to get a better handle on the structure. Upper air winds are still forecast to stay strong which should weaken Henri over the next few 24-48 hours. Rainfall with Henri will mostly move north of the Leewards. An upper air trough over Puerto Rico into the central Caribbean is helping build a line of showers and storms into the Lesser Antillies. Rain occuring now is due to the upper trough. At 7 am edt / ast tropical storm Henri was centered near 18.2° N / 56.3° W or about 430 miles east of the northern Leewards. Top sustained winds are estimated at 45 mph (NHC 50 mph) with stronger gusts in the storms to the east of the center. Henri was moving west northwest at about 17 mph. The first few visible satellite images are coming in. If confirms what the Quickscat is showing.....a very weak surface low just west of the deep convection. Upper air winds have sheared Henri badly and it really is no longer a tropical storm. 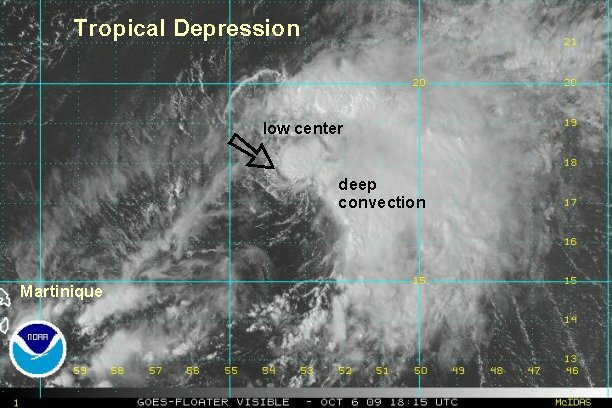 Deep convection is confined southeast of the center where there may be some downdraft winds of 40-45 mph. Winds with the circulation center are most likely no stronger than 30 mph. 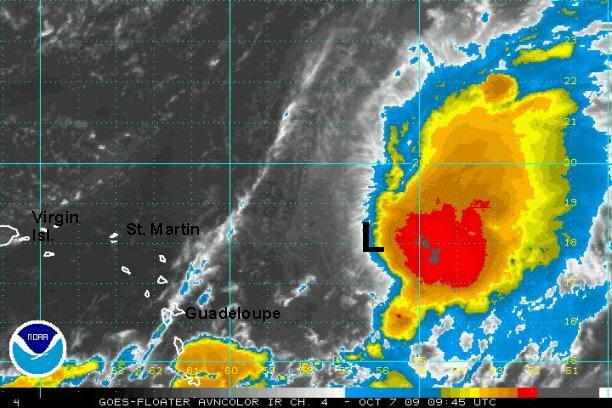 At 2 pm edt / ast "tropical storm" Henri was centered near 19.1° N / 58.2° W or about 240 miles northeast of the northern Leewards. Top sustained winds are estimated at 30 mph (45 mph NHC last advisory) with stronger gusts in the storms to the east of the center. Henri was moving west northwest at about 19 mph. this will be our last update on Henri, unless regeneration occurs. NHC will probably hold onto Henri for the 5pm edt advisory then call it a remnant low. Here's recent visible satellite imagery. The surface low is almost not discernable any loner. Deep convection still exists east of the weak low.